I do pro bono work to lend my professional capacities to the greater good. One project involves marketing, writing and media relations for a local Community Supported Agriculture (CSA) program, Ashland-Talent Growers CSA. I recently landed an article for them, working to raise awareness and support for their effort. You can check out the article here. An excerpt is below as an appetizer as well. I’ve been a member of and volunteer for CSAs for several years. Buying straight from farmers is the best way to get delicious, fresh, safe, affordable, local, organic produce while supporting your economy. Volunteering helps you feel even better and gets you in better shape than any machine or class at a gym, for free! Stop by your farmers market, join a local CSA and buy local food. It’s a treat for you, the planet and your community economy. What could be better? 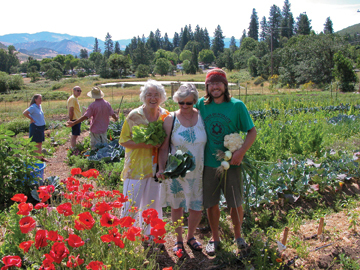 Three local farms are coordinating their efforts to offer fresh local organic produce for Ashland and Talent residents every week starting in June. “It’s a start of a collaboration that will be increasing local derived food and an increasingly locally based food system,” Chris Hardy of Village Farm said. The agreement enables the three farms to concentrate on fewer crop types. “When you’re trying to do a CSA alone on a farm you have to grow a lot of everything,” DiGiorgio said. “People are looking for a diversity of vegetables in their boxes. When you’re working with three other farms you can figure out a way to share that… read the rest of the article here. This entry was posted in Agriculture & Food, Communications/PR & Marketing, Writing & Presentations and tagged organic. Bookmark the permalink.